A cast of seafaring creatures welcomes you home or wishes you well on your way. 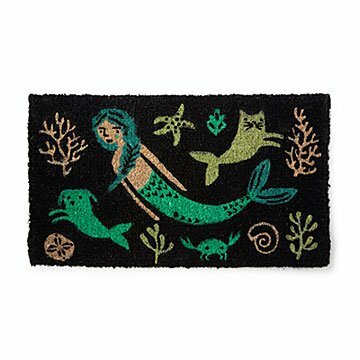 Make no mermaids about it: This coastal themed mat gives your home a hint of deep sea magic. As you enter or exit your house each day, a cast of seafaring creatures—including a crab, mermaid, and a dog and cat with fins (also known as a "mercat" and "merdog")—welcomes you home or wishes you well on your way. Woven from 100% coconut fibers and fade resistant ink, the design is as durable as it is utterly whimsical. Made in India. I bought this same doormat last year and the colors were more nuanced and the pattern more detailed on that version. The mat was also slightly bigger. After a year of use, the pattern was largely worn off the old one so I replaced it. The new version is not as nice looking, so I will probably look to a brand other than Danica when this one wears out. Yes. To bring joy to another mermaid lover. Given as a gift for use at entrance. It was waiting for us when we arrived to visit our friends. They love it! Like it a lot. It is thick and has vibrant colors. Got a bicycle mat last year, which has faded. Hoping that this one stands up. Have it in a protected porch area. This doormat is made surprisingly well and is very thick. So much more fun to look at than the $30 ones at hardware stores. The mermaid has pets! A sea dog and a sea cat so adorable!!! The new mat adds some fun color and spirit to the back door. At first our kitty didn't want to step on it! But she's gotten over that and is enjoying it too (feeling her mer-catishness). Great quality! I would buy this product again. This mat is thick and durable. It is the perfect welcome mat for our home.